Since Brut IPAs entered the Australian scene (and subsequently visited almost every brewery in this fair country), there’s been a broad spectrum of what they look, taste, and feel like. Some are so champagne-esque that you could christen a boat with them, while others are I-can’t-believe-it’s-not-a-regular-IPA. 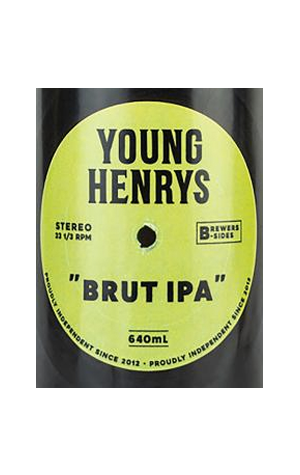 The most recent entry in Young Henrys’ “Brewers B-Sides” series, where the brewers get to play around with new or weird flavours, is their take on a Brut IPA. On the spectrum, it’s closer to the IPAs to which we’ve grown accustomed, but with the higher carbonation of the style lifting the hop aromas to lofty levels, as well the crisp finish that can allow a 7 percent ABV beer to sneak up on you if you’re not paying attention. It’s single hopped with HPA’s experimental hop HPA-016 (perhaps not quite as catchy a name as Galaxy), which gorges the senses with ripe mango, orange marmalade, and pine needles, with only a sprinkle of bitterness. One of the hoppier Brut IPAs currently around, and ideal for those who love their IPAs, but are still skeptical of this fancy new style.